A Day For "KNIGHTS" To Shine! Jax Cornejo, son of Jesse and Airily Cornejo, a 7th grader at WMS and winner of this past Fall's Sumner County Spelling Bee, carried that title with him to Hays, Kansas today for the Regional Spelling Bee and made it to the 8th round and finished 8th out of 95 participants and medaled to boot!!! The word Jax went out on..."efficacy"... but spelled some tough ones up to that point! Wellington is very proud of you Jax!! Way to represent KNIGHT!! That is awesome! Just in from PIONEER LEAGUE WRESTLING in Ark City! The KNIGHTS have "3" Pioneer League Champions!! 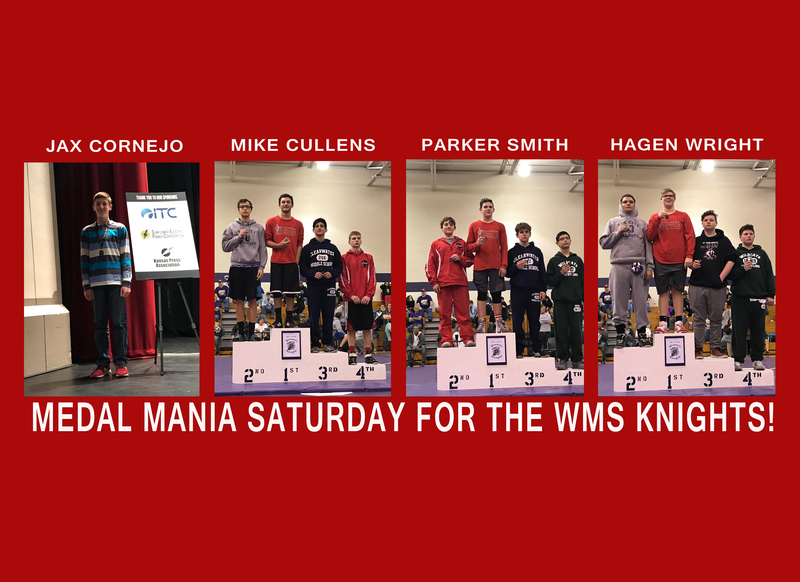 Congratulations to Mike Cullens, Parker Smith and Hagen Wright! Congrats to the whole squad - many 2nd and 3rd place finishes and medals as well!! Awesome Job Knights - 2nd Place Finish as a team!! Congratulations Jax, Mike, Parker and Hagen - today you 4 young men represented well!! Awesome gentlemen! !